Hemlock Edge Rescue has traveled down to Baltimore, loaded up on supplies donated by a very generous donor, and is on their way to the hardest hit areas of North and South Carolina. While they are loaded with dog food, paper towels, cleaning supplies, and grit, we are still in desperate need for donations to bring back animals from the over crowded shelters. Please share our story and maybe consider making a donation! We appreciate the endless support! Hemlock Edge Rescue is going to Louisiana! With more than 3,300 animals displaced by the recent flooding in Louisiana, shelters need our help. H.E.R. is taking on the 17 hour drive down to help the local rescues by donating dog and cat food, supplying man-power, and even packing up a few dogs to bring back up North. This won't be possible without the help and support of YOU! Follow Cris, Jacey and the girls on their journey to Louisiana! With about 10 hours to go, the girls have sent an UPDATE! They are planning to stay in their hotel tonight and get a good night sleep. Tomorrow, they will split up and tackle the hard work of clean up after the devastating floods at both Tangi Shelter and Denham Springs Shelter. Both rescues will receive 500 pounds of donated dog food. On Sunday, before heading home, the girls will load up the van with as many dogs as possible from Jefferson Parish in New Orleans. Keep a look out for the dogs available for adoption upon their return! 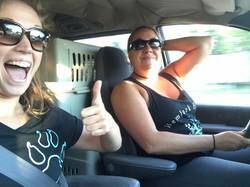 Update - The amazing Hemlock women are on their way home! They managed to bring back 19 dogs that needed rescue! Check out Hemlock Edge Rescue on Facebook to watch videos and see even more pictures of what they faced on their adventure down South. Check back later for pictures of the new Hemlock dogs and find out when they'll be available for adoption!